On 5 February 2015, the Netherlands Hydrological Society (NHV) held its General Members Meeting at KWR. 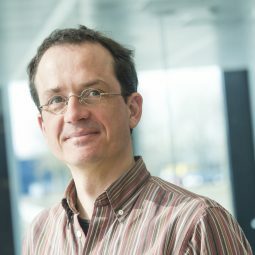 On the occasion the second Kees Maas Award since 2011 was handed out – and to the person the award is actually named after. Geohydrologist Kees Maas, who in 2012 retired after more than 24 years at KWR, was honoured with the award for his 2012 article entitled ‘Valkuilen in de tijdreeksanalyse: Het geval Terwisscha’ (Pitfalls in time-series analysis: The case of Terwisscha). Every three years, the Netherlands Hydrological Society grants the Kees Maas Award for the best article in the field of hydrology and water management appearing in its own publication, Stromingen. The award was instituted in 2011 to stimulate experts in the field to publish in Stromingen. The award was named after NHV honorary member, Kees Maas, for his great dedication to the NHV and thorough work in geohydrology. The criteria used for the award’s attribution include the article’s scientific quality, originality, clarity and inspirational impact. The jury decides on the winning article on the basis of the input by NHV members via a digital poll.